The village of Luss on the shores of Loch Lomond, Scotland, may consist of virtually only one street, but its setting and the careful way in which the buildings have been preserved, combine to make it an attraction of some note. Luss lies in Clan Colquhoun countryside on their private estate. It is situated at the foot of Glen Luss, where the River Luss runs into Loch Lomond. 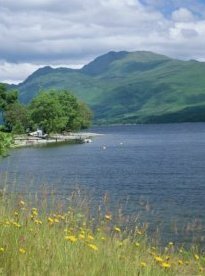 Ben Lomond, the most southerly Munro, dominates the view north from the village of Luss, over Loch Lomond, and the Luss Hills rise to the west of the village. The village is rich in wildlife, both on and off the loch. The hillside above is well wooded and you can sometimes hear the roaring of stags. Up to four generations ago, the homes of the natives of Luss were typical of all Highland crofts. Accommodation comprised a self-contained but and ben, which was whitewashed and thatched. It had one door entrance to the front and two small windows. These were knocked out of the at least two foot thick solid walls, which were made of local stone and slate. The dwellings also contained open fireplaces that jutted out into both compartments. Most houses had a cellar attached to the back and this now provides the kitchen area of some present homes. The floor of the but and ben was usually bare earth covered with slabs of slate, which were carried down from the hillside. Most of these mainly estate houses can be seen lies along Pier Road, which consists of small semi-detached stone cottages with slated, hipped roofs, paired octagonal chimneys and diamond pane casement windows. Each cottage has a small garden fronting on to the road. Further estate development took place in 1870 with the erection of a pair of semi-detached blocks in Church Road, while more units were added in later Victorian times. The present church was built in 1875 by Sir James Colquhoun of Luss in memory of his father, who was drowned in the loch. It contains some relics from the Colquhouns' private chapel in Rossdhu, including, in the churchyard, an old stone font and a hog-backed stone sarcophagus thought to be a 10th century effigy of St Kessog. In addition, the chiefs of the MacFarlanes of Arrochar are buried in the churchyard. This picturesque church, the third built on this site, on the banks of Loch Lomond with its beautiful stained glass windows and uniquely timbered roof, featured frequently in "Take The High Road". The ancient graveyard has 15 listed ancient monuments. But know no better how to die. O yiss! O yiss! O yiss! There will be no Lord's Day here next Sabbath, because the Laird's wife will have a muckle washin', and she needs the kirk to dry her claes in. Rossdhu, the seat of the Colquhouns since the 14th century, lies south of the village. The mansion was built in the late 18th century to replace an old castle. Boats carrying tourists call at Luss throughout the season, but the highlight of the year is the Luss Highland Games which always take place in the week of July. The gathering is now attended by many thousands of people corning by coach and car to the games fields, just a few minutes from the village.